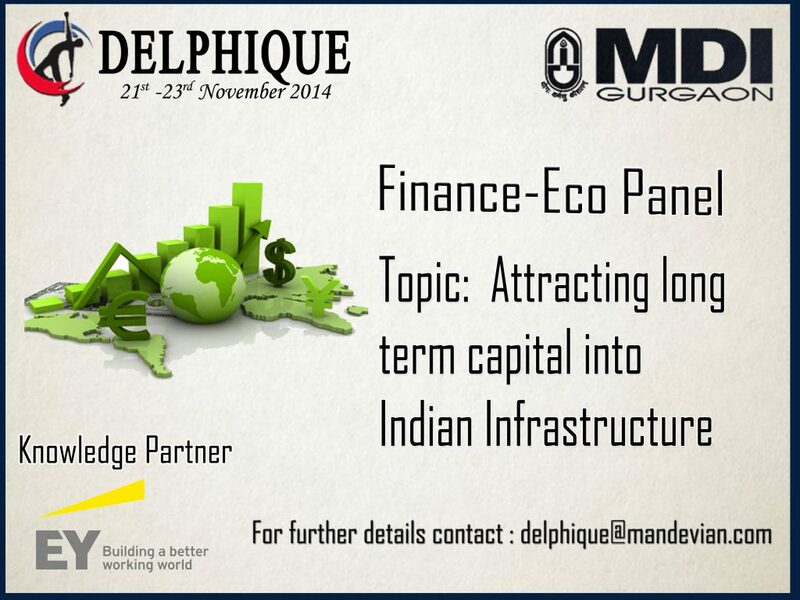 Delphique 2014, the National Management Convention of MDI, Gurgaon presents an opportunity to students to be a part of the Finance and Economics Research Panel with Ernst & Young (EY). Mr.Rajesh Samson, Partner, Ernst & Young shall be gracing the panel discussion with his esteemed presence. The students shall present their research on “Attracting long term capital into Indian Infrastructure sector – taking a fresh look”. The association with EY for this research is a huge opportunity for students at MDI, Gurgaon to gain industry exposure and insights. Mr.Vikas Sharma, AVP, Transaction Advisory Services at EY is the industry mentor for this panel and students are having a significant learning experience under his guidance. The research objectives of this panel in brief are: study of the current policy and regulatory framework and its effectiveness in attracting investments in Indian Infrastructure sector, alongwith relative comparison of Indian policy framework vis-a-vis other markets from investment attractiveness perspective and understanding the existing avenues (and their contribution) by which capital is flowing into the Indian Infrastructure sector i.e. bank financing, domestic equity funding, FDI, ECB, FCCB, etc. The research also includes exploring the methodology to attract investments from long terms investors like insurance companies, multilateral financial institutions, etc. to meet equity/debt requirements of Indian Infrastructure sector. the students are also envisaging policy changes required to attract more long term funds for Indian Infrastructure sector. About EY: EY is one of the big four audit firms which is mainly involved in providing assurance, tax, consulting and advisory services to companies across the globe. The company is headquartered in London, UK and has revenues worth $27.4 billion. EY believes in leveraging their global reach and scale to converse about challenges facing economies and the capital markets and is committed to building a better working world by making business work better.